Convenience stores are Japan’s largest single retail sector, and the most concentrated. With Familymart acquiring Circle K Sunkus last year, the leading three chains now account for more than 90% of all sales. Only two major questions remain for the sector: What will happen to the few remaining independent chains? Most likely merge or die. How will the big three continue to grow? While a much more complex question with plenty of possible answers, Seven Eleven, Lawson and Familymart still have lots of new ideas, including working with more international brands, and, at least in the medium term, growth is likely to continue. 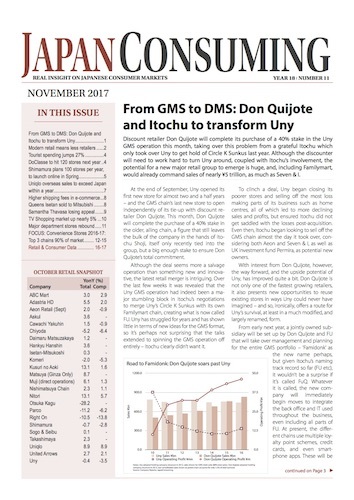 Discount retailer Don Quijote will complete its purchase of a 40% stake in the Uny GMS operation this month, taking over this problem from a grateful Itochu which only took over Uny to get hold of Circle K Sunkus last year. Although the discounter will need to work hard to turn Uny around, coupled with Itochu’s involvement, the potential for a new major retail group to emerge is huge, and, including Familymart, would already command sales of nearly ¥5 trillion, as much as Seven & I. Retailers and brands continue to benefit from the ongoing surge in visitors to Japan, but equally, spending per tourist has also risen significantly in recent months, following a dramatic drop in 2016. The 40s to 60s womenswear market remains under-developed despite being one of the few growing population segments. One of the more successful retailers in this segment is DoClasse, which is set to become a 120 store chain next year. Shimamura is now a 2,000 store apparel retail group, with sales closing in on ¥600 billion. While Uniqlo is far and away the biggest apparel retailer with sales of ¥800 billion, growth has slowed (see page 7) and Fast Retailing doesn’t plan many more stores here, focusing instead on overseas. Shimamura, however, says there is room for 3,000 of its stores in Japan alone, including, at last, a major push into city centres. Uniqlo is still growing, especially on a same store basis (see Page 1 snapshot) but has reached store saturation at home, and most investment is being targeted towards e-commerce. The real focus now is overseas, with sales expected to exceed Japan within a year or so, almost all of this is from Asia. Europe and the US still need work. As couriers begin to hike prices to offset the huge growth in demand for home delivery services, e-commerce providers are worried about slower growth in the burgeoning sector. In practical terms the new delivery prices are unlikely to be a major long-term issue. Following the lead of Sogo Seibu, department stores are divesting businesses that don’t fit and that drag on profitability. The latest is Isetan-Mitsukoshi which has sold its Queens Isetan supermarket chain to Mitsubishi. Domestic bag brand Samantha Thavasa was one of the hottest local fashion brands in Japan in its early years, with clever marketing providing some competition to imported handbags. Today, however, things don’t look too good, and it seems that a marketing misstep may well be to blame. The brand is struggling to put things right. TV Shopping should be in decline now that everyone is focused on e-commerce, but the latter is enabling the former, freeing up broadcasts from the TV to expand to a myriad of screens. So far, though, this shift only seems to be benefiting the major broadcasters, who already own close to half the market. Major department stores have rebounded from a tough FY2016 with much stronger sales to both Japanese and tourists in the last six months. Not all have benefitted, due to store closures and restructuring, but even the laggards are showing improvements on a same store basis.